It was my sisters 18th birthday yesterday and she is really hard to buy presents for! She loves cameras both vintage and new however she already has quite stash of them and she's not really into jewellery or anything. For her 18th I wanted to give her something more special and I had wanted to give her a Coach wallet (on sale too!) as my mum says in Chinese culture giving a wallet as a birthday gift brings the person prosperity or something. However, my sis totally nixed the idea along with a whole heap of other suggestions. 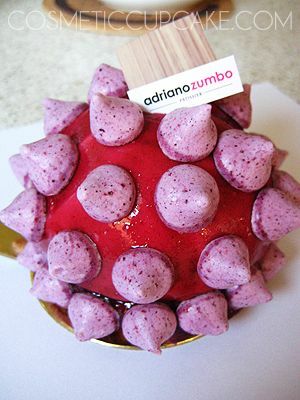 So I decided as part of my birthday gift to her would be some desserts from the one and only Adriano Zumbo. And it was abso-bloody-lutely worth the trip!!! I was like a kid on Christmas morning going there haha. I lucked out and got parking right outside the store as soon as I got there too. Woot! 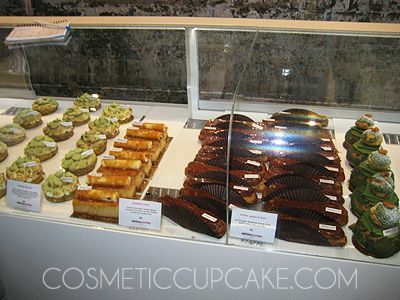 There were so many delicious looking desserts and macarons and they also have bread at the patisserie too. 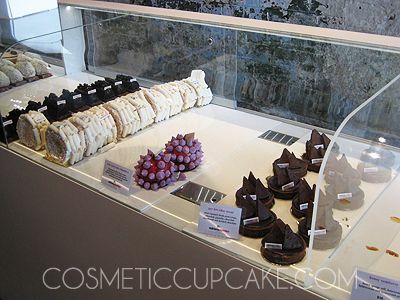 And the new Chocolat Cafe is now open too ;) Here are some piccies to make you drool! 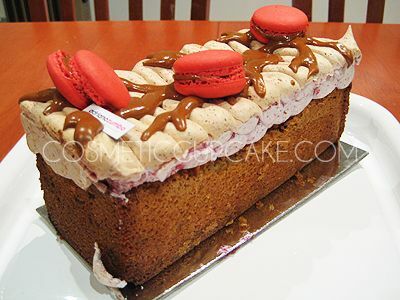 PAVNUTCHESTRASP cake: Chestnut & olive oil cake with a raspberry pavlova & chestnut pieces (Gluten Free). This was the last one they had left and it was only just after 11am. I was standing in line and crossing my fingers and toes hoping that no one would buy it! It tasted absolutely beautiful. 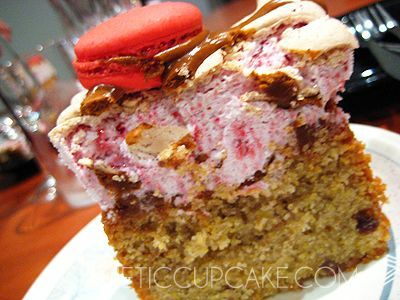 The pavlova was light and fluffy with just enough raspberry; the macarons were the perfect texture and the chestnut cake was moist and dense but not too rich. Heaven! 4 Times the Vitamin C: Blackcurrant jelly, blackcurrant marshmallow, vanilla violet mousse, pistachio feuilletine, pistachio dacquoise & blackcurrant glacage. I just had to get this dessert as it looked so interesting on his website! It was the last one left too =p This dessert is for my sis to eat all by her greedy self and she hasn't tried it yet for me to steal a bite lol. My sis says it looks evil LOL. 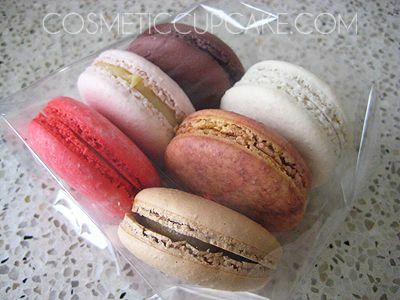 I also purchased 6 macarons (1 of each available flavour) in (From t - b, l - r): Beetroot and Raspberry; Oatmeal and Ylang Ylang; Kalamata olive & bergamot candy; blackened vanilla bean (? ); Coffee & Caramel and Mont Blanc. My sister loves macarons and had wanted to try these out the most and they definitely didn't disappoint! Krissy from Random Life of a Random Girl held a random giveaway at the start of August and I won! 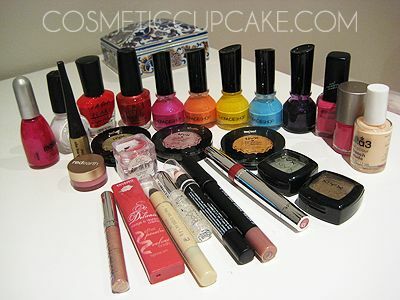 My prize arrived during the week and I have more nail polishes and makeup to play with yay! Not that I should be playing with all these things right now =( Thanks for holding such a cute giveaway Krissy! 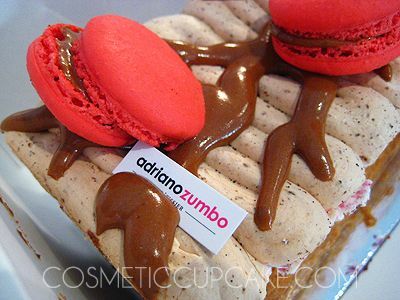 Oh i'm dying to go to Zumbo! So many raves, I just hope it is as yummy as it looks! No fair, you Sydney girls get all the good shops! I looked at his website, am I correct in seeing that the v8 cake is $125??? The dessert looks so delicious! I've really got to head out to the city more often, all the good shops are there. Oh and this post reminds me of MasterChef haha. @London's-Beauty: Thanks hun! 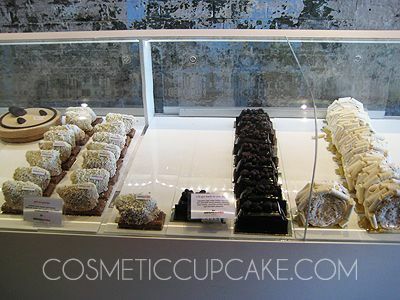 I nearly had sugar overload just looking at all the delicious treats =p I definitely drooled! @Serena: From the few items I've tried, it's DEFINITELY as good as it looks. 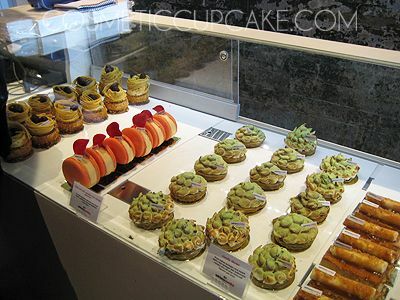 But having said that, the desserts are very reasonably priced for the effort and time it takes to make his creations. The PAVNUTCHESTRASP cake was only $20!!! You pay more at Michel's Patisserie for something way less spectacular. @Shazzii: I just need my cravat then LOL. It was simply delicious, you must try and head out there if you can! O_O!! *drool* they look soooo gooodd!!! now im hungry for some pastries! congrats on winning 'chelle!! whoa~ i found reading this slightly uncanny because my friend had bought the Pavnutchestrasp cake as a present for his sister's birthday too!! Though that was last weekend haha~ anyway i loooove Zumbos! 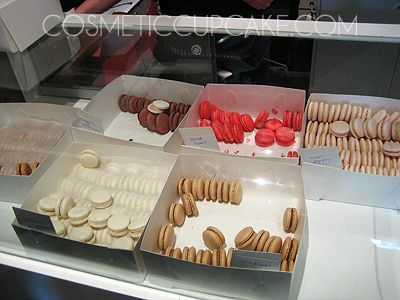 I still haven't tried Zumbo macarons cos when I'm there they are always gone :( Need to visit after my assignments are done haha! Wow, lucky you! :) I was just thinking what a coincidence it was that you wanted to get your sis a Coach wallet for her 18th, when my friend's 18th was yesterday and her sister offered to buy her a Coach purse! But I get it now, it's the Chinese superstition. 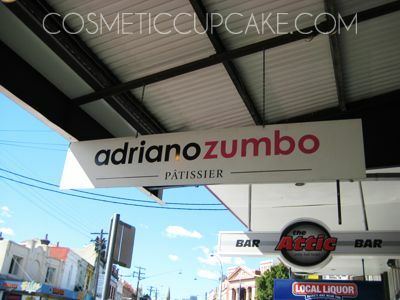 Ah, Adriano Zumbo. After watching him on Masterchef for 2 seasons, his fame has shot up the roof, and yet I STILL haven't gotten a chance to visit him yet. They all look so wonderful and I agree with konad-licious you get all the good shops. And congrats on winning can't wait to see your reviews. oh wow, i would have wanted so many. they all look so yummy!!! OMG! WHY MUST YOU TEMPT US LIKE THIS! PLEASE AIR MAIL ME SOME! I don't care how much it costs! I will pay! I just want it in my mouth! lol. Man your sister must have been a happy camper that night! I know I would have been! LOL. @Nikki: Lol sorry to make you want pastries! Yeah I was so excited cause I never win anything hehe. 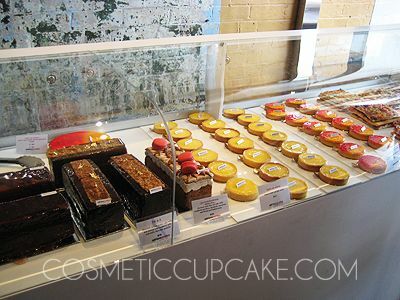 @yokeMun: I want to try every piece too! They're are just so delicious looking. @Joan: Yeah it's a Chinese superstition, but what a coincidence! Definitely visit the patiserrie if you can. @Bev: Ahhh sorry to make you drool! Living in Sydney can be hectic though, I wouldn't mind living away from the city sometimes. Just think for you though it's similar distance to get to Sydney AND Melb for the best of both worlds ;) You're closer to GAP when it opens! Yeah my sis was pretty happy which is nice!